Eileen Myles 's Inferno (a poet's novel) is just out from OR books. For the essay collection The Importance of Being Iceland (2009), she received a Creative Capital/Warhol Foundation grant. Sorry, Tree (2007) is her most recent book of poems. In 2010, the Poetry Society of America awarded her the Shelley Prize. Keith Gessen is a cofounder of n+1 and the editor of It’s No Good: Poems, Essays, Actions by Kirill Medvedev, due out from n+1 and Ugly Duckling Presse in December 2012. Elevator Repair Service , a theater ensemble, was founded by director John Collins and a group of actors in 1991. At MoMA PS1, ERS presents a sneak preview of a new collaboration with installation artists Ben Rubin and Mark Hansen. They will playfully mine several of their past shows—including the acclaimed Gatz, a six-hour enactment of The Great Gatsby—and reimagine the material as it falls apart and reforms itself into unexpected new scenes. The work will feature Mike Iveson Jr., Vin Knight, Scott Shepherd, Susie Sokol, Victoria Vazquez, and Ben Williams. The Review of Contemporary Fiction was launched in 1981 to provide a critical discourse around innovative literary works of the highest caliber that have largely been ignored by the mainstream media. Over the years, the Review has provided an alternative canon for contemporary fiction and has introduced such writers as David Foster Wallace, David Markson, and Gilbert Sorrentino, well before they were embraced by the critical establishment. (Wallace served for a time as an editor of the journal, and guest-edited a “Future of Fiction” issue, in 1996.) The Review has also published numerous anthology issues dedicated to new writing from foreign countries, special issues dedicated to innovative publishers (Grove Press, Editions P.O.L), and special topic issues, including the present “Failure” issue. April 2, 2011 3–5 p.m. 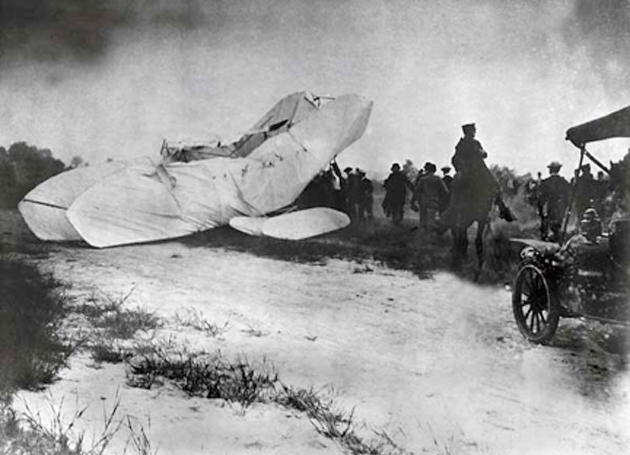 The first fatal airplane crash in history, September 17, 1908. A plane co-built and piloted by Orville Wright suddenly fell one hundred feet, overturned in the air, and crashed in Fort Myer, Virginia. Photo courtesy the Associated Press. Triple Canopy and Dalkey Archive Press present an afternoon of failure to celebrate the release of The Review of Contemporary Fiction's "Failure" issue, guest-edited by Joshua Cohen and available here. The program will include attempted readings from the issue by Eileen Myles, Helen DeWitt, Sam Frank, Travis Jeppesen, and Keith Gessen; a malfunctioning tribute to the classics of American literature by the theater group Elevator Repair Service; mangled covers of pop songs by US Girls; and an effort by Derek Lucci to resurrect William Gaddis.